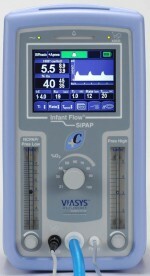 Infant Flow SiPAP is a device which enables the Biphasic continuous positive end-expiratory pressure (Biphasic) by addition of an intermittent “Sigh, SiPAP pressure” to the nasal DPAP. It is expected to prevent aveolar collapse caused by lung recruitement effect, maintain FRC, reduce work of breathing, and stimulate respiratory center . A baby can breath spontaneously at either the high or low CPAP level, which has different meaning from conventional machanical ventilation. It is also expected to become a powerful tool to extubate preterm babies from ventilators, however, further discussion should take place for its usage. 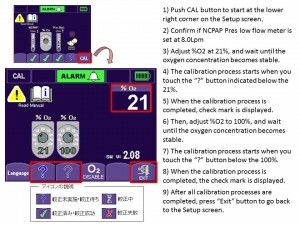 Operation of this device is all performed with the touch screen display except for the power switch at the back and oxygen concentration setup, and 2 flow meters at the front panel. The device has a two hour internal battery. The display is locked if there is no entry thorough display in 120 seconds to prevent inadvertent entry. When high priority alarm activates this display lock will be awoken. Infant Flow SiPAP has 2 basic modes, nCPAP & Biphasic. 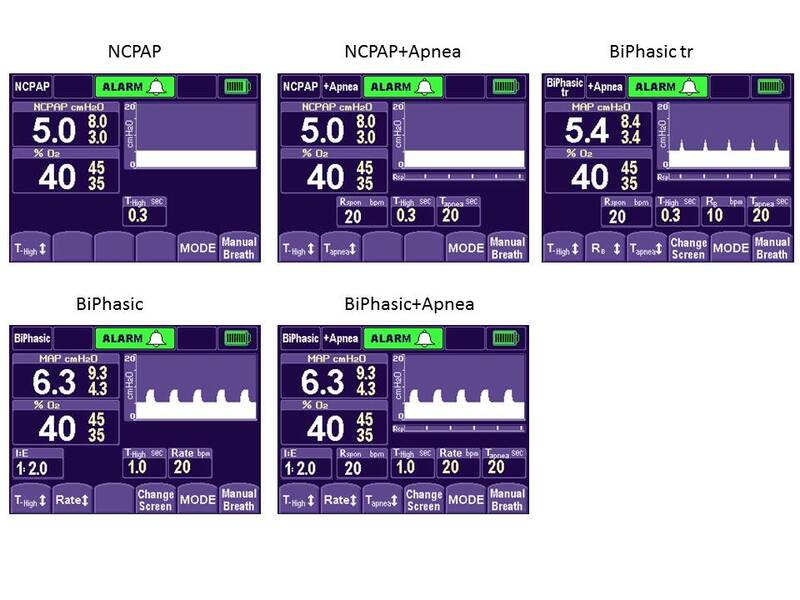 With the use of abdominal respiratory sensor enables 5 configurations including NCPAP + Apnea, BiPhasic + Apnea modes with breath rate monitoring and apnea alarm function, and BiPhasic tr enabling synchronized mandatory ventilation. The operator manual says “intermittent mandatory ventilation is available with BiPhasic mode”. 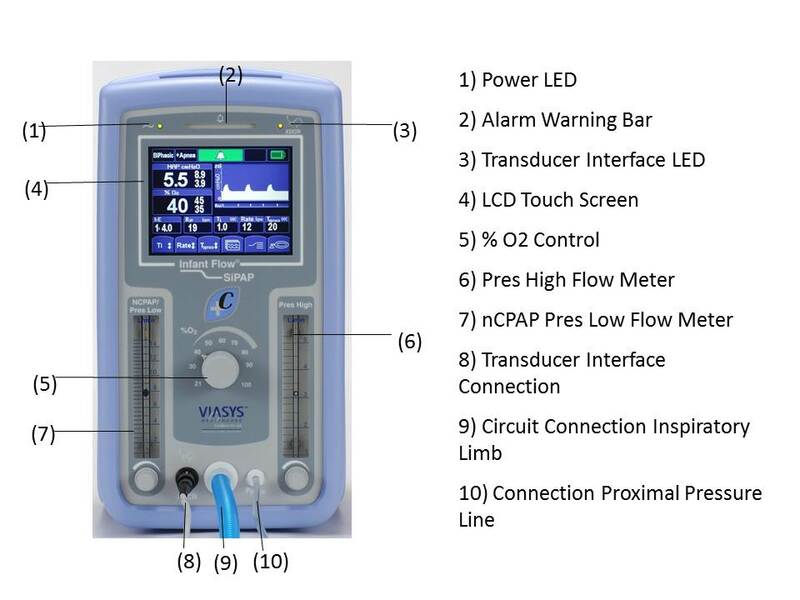 To be exact, as mentioned in the “Introduction” section, it should be considered as CPAP with BiPhasic airway pressure and not intermittent mandatory ventilation. On Table 1, it says T-high(inspiratory time), however, as it is possible for the patients to have spontaneous breathing, the expression “Inspiratory Time” is not exactly correct and we will describe it here as “Duration of SiPAP pressure”. As mentioned later, the duration of SiPAP pressure is usually set at 1.0sec, but the meaning would be different as the spontaneous breathing is triggered with BiPahsic tr mode. At this stage, there is no specific setting recommended, but approximately 0.3 second would be considered appropriate. 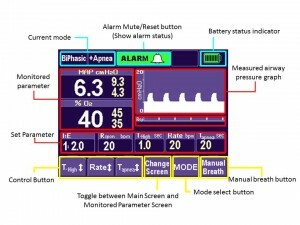 With BiPhasic tr mode, the backup breath rate is set and mandatory ventilation is performed for every detected spontaneous breathing, which is equivalent to A/C(assist control) mode for conventional ventilators. When the device is turned on, power-on check will run automatically, and after the power-on check, the screen changes to Set UP Screen. 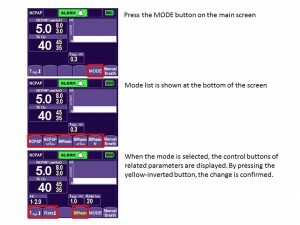 After the full-functional check/power-up check (this will be explained in the next page) is performed, the ventilation starts at NCPAP mode and the screen changes to Mode Select Screen. Usually, when the Mode button at the Main Screen is pressed, the mode select screen is displayed. After requested mode is selected, the control buttons of corresponding parameter are displayed. 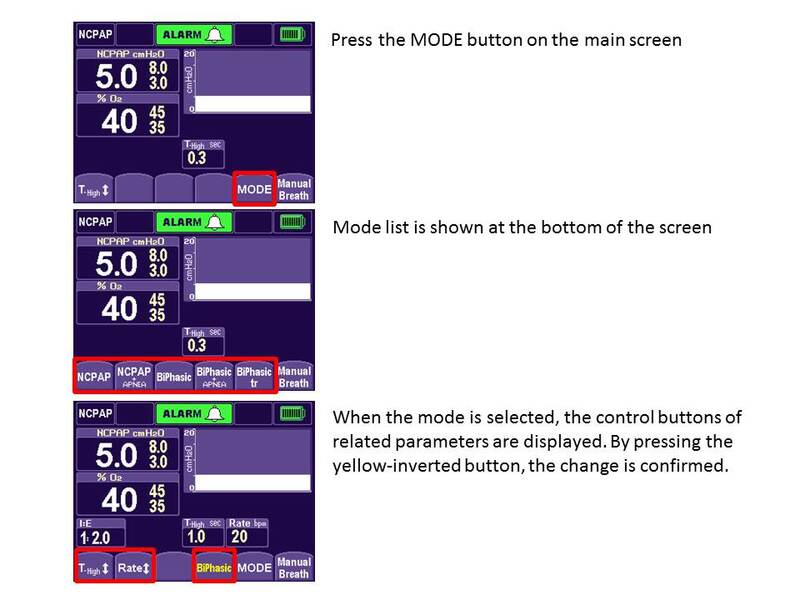 Adjust each parameter and press the yellow-inverted button to confirm all changes (Figure 2). 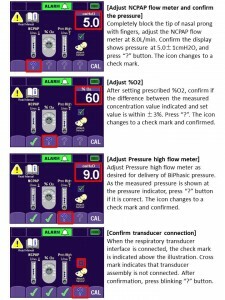 As there is no applied pressure at the starting time of set-up, pressure indicator shows 0.0cmH2O with alarm activated. Push the alarm mute button to mute for 30 seconds, and start full functional/power-up check. Until all the check is completed, the tip of nasal prong(nasal mask) should be sealed. If there is a big difference with measured value of oxygen concentration at the time of check prior to use, push “CAL” button at the right bottom to perform O2 sensor calibration. Make maximum use of the functions! 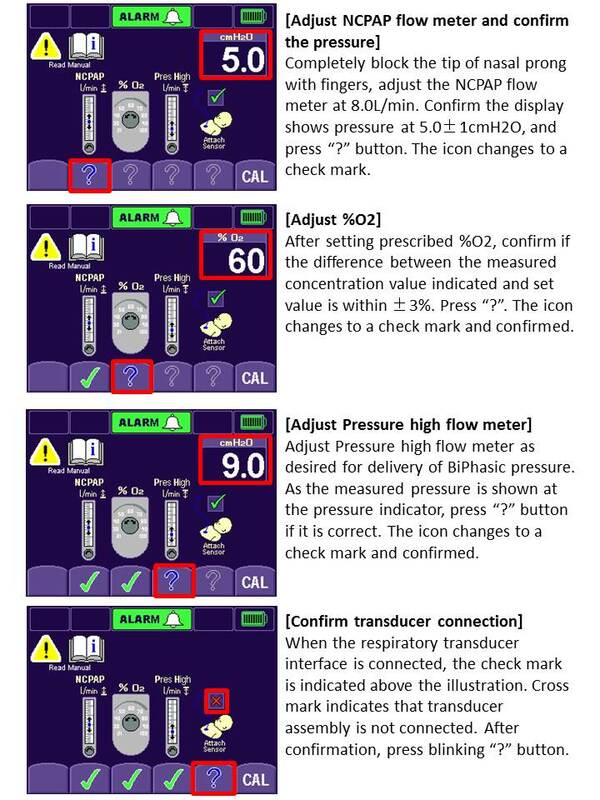 Screens of Airway over-pressure limit alarm and High/Low airway pressure alarm are shown in Figure 5. 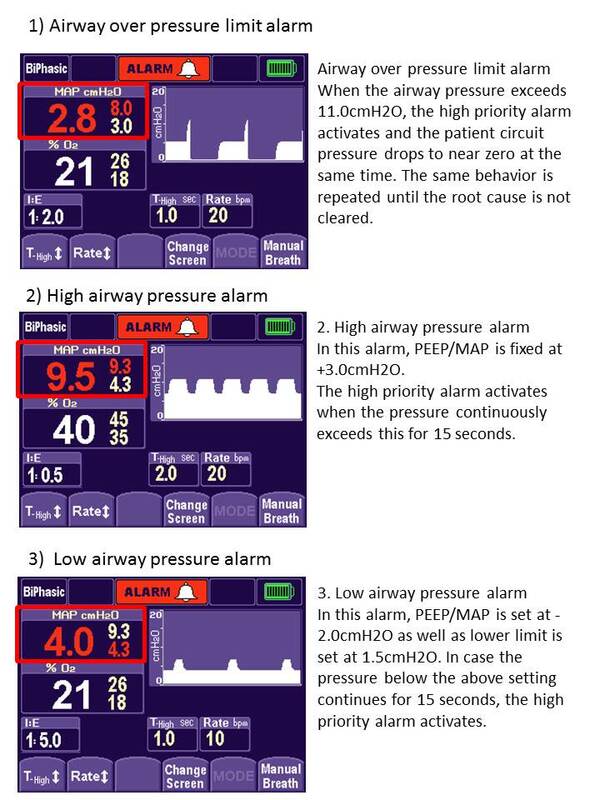 Upon activation of airway over-pressure limit alarm, the patient circuit pressure drops to near zero at the same time. The pressure is restored after 3 seconds, however, the same behavior is repeated if the root cause is not cleared. 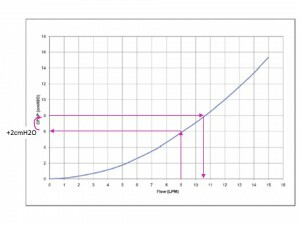 High airway pressure alarm warns if airway pressure exceeds the current set value while Airway over-pressure limit alarm functions as a relief valve against excessive pressure. Note the difference of each role. 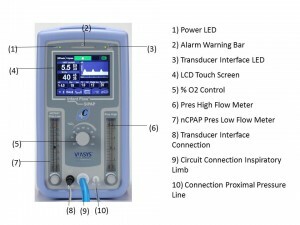 Airway over-pressure limit alarm can be set to maximum 15cmH2O only with BiPhasic tr mode. 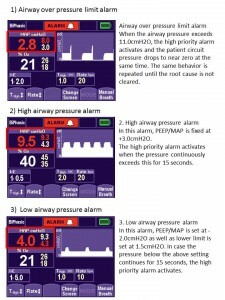 High/Low airway pressure alarm is set at +3cmH2O(high) and -2cmH2O(low) at the time. In other words, 3cmH2O below the high pressure alarm indicated value is the baseline pressure value at alarm setup. 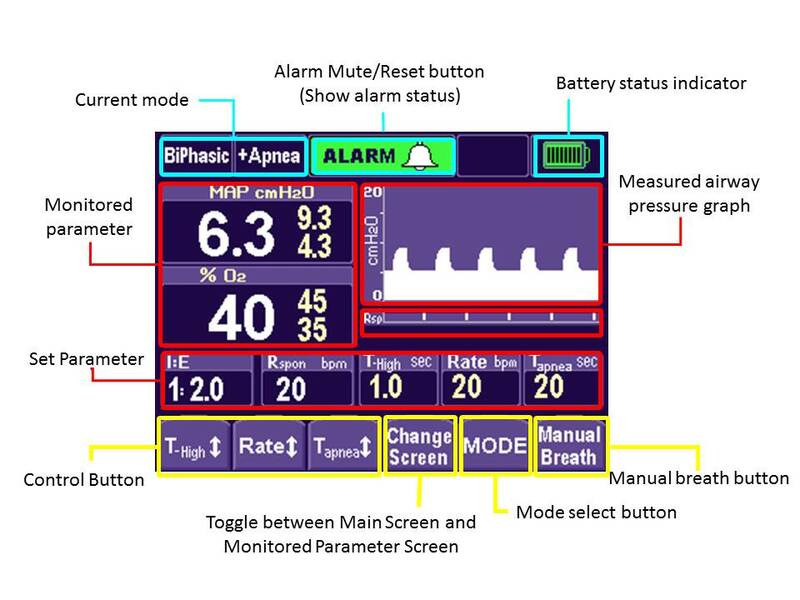 According to Courtney et al 2) the SiPAP pressure should be set between 1 and 3cmH2O above the baseline CPAP level. SiPAP duration should be set to 1 second. Initial frequency should be started from 30 cycles and at the weaning the frequency should be gradually decreased according to patient’s apnea condition to aim at the normal CPAP level. 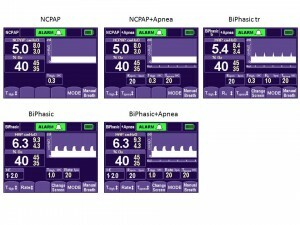 The Figure 6 shows the relationship between NCPAP flow and airway pressure. For example, when the flow is at 9Lpm, the airway pressure should be approximately 6cmH2O. 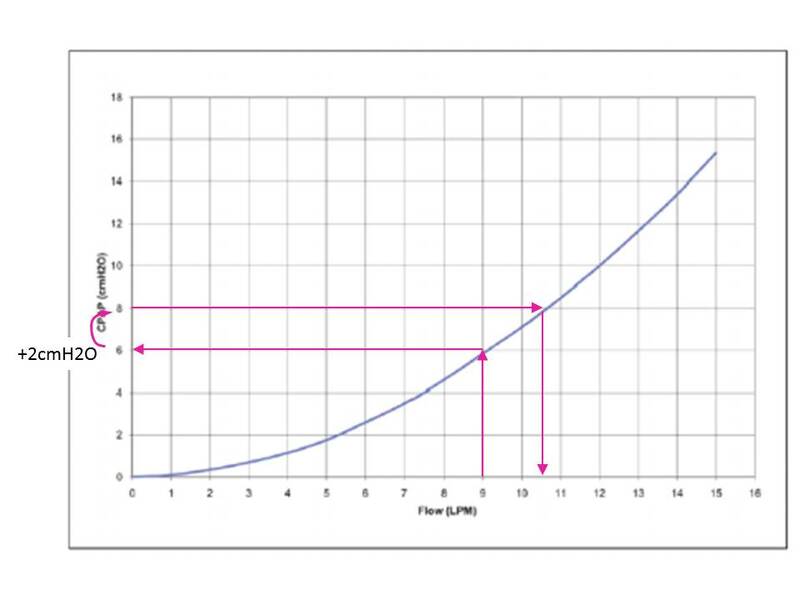 If we try to increase SiPAP pressure by 2cmH2O, then the necessary flow will be 10.5Lpm, which makes BiPhasic flow meter at about 1.5Lpm. Generally, the higher CPAP condition may lead to abdominal distension, however, the investigation at our department 3) shows many abdominal distensions were found in the cases where SiPAP was being used at earlier week(timing of extubation) or where SiPAP was used for a long period of time with higher settings. These days there are many cases that the initial cycle frequency is set to approximately 15 cycles and eventually increased/decrease according to patients’ apnea condition. 3) Kojiro Terada et al. Investigation of use of Infant Flow SiPAP at my hospital – case and status of dealing with abdominal distension, periodical of Japan Society for Premature and Newborn Medicine, 23, 2011, 604.